There are two ways to uninstall packages that were installed using Jamf Pro: using a policy or using Jamf Remote. When you uninstall a package, you can remove the package from Autorun data. Note: If the package is an Adobe CS3/CS4 installation, it does not need to be indexed or configured so that it can be uninstalled. Click the Computers tab at the top of the page. Use the General payload to configure basic settings for the policy, including the trigger and execution frequency. For an overview of the settings in the General payload, see General Payload. Select the Packages payload and click Configure. Click Add for the package you want to uninstall. Choose “Uninstall” from the Action pop-up menu. Configure the settings for the package. To remove the package from each computer's Autorun data, select the Update Autorun data checkbox. For more information on Autorun data and Autorun Imaging, see Autorun Imaging. 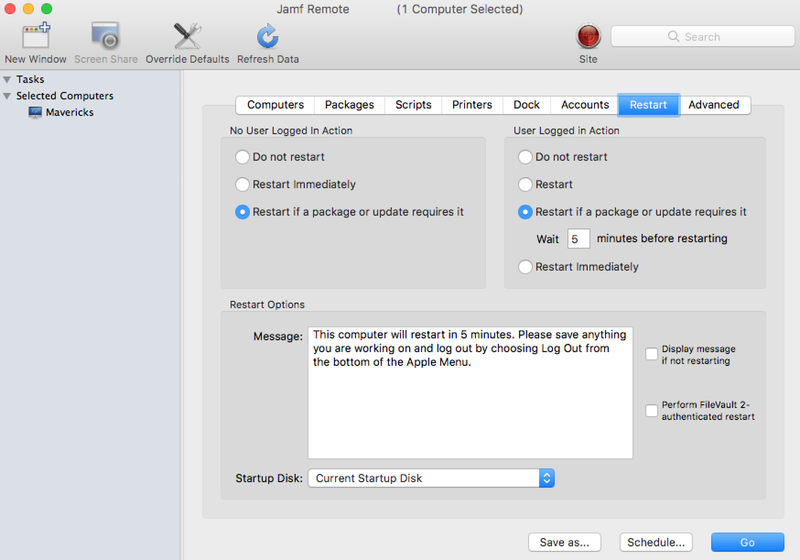 Use the Restart Options payload to configure settings for restarting computers. For more information, see Restart Options Payload. Click the Scope tab and configure the scope of the policy. (Optional) Click the Self Service tab and make the policy available in Self Service. (Optional) Click the User Interaction tab and configure messaging and deferral options. For more information, see User Interaction. The policy runs on computers in the scope the next time they check in with Jamf Pro and meet the criteria in the General payload. 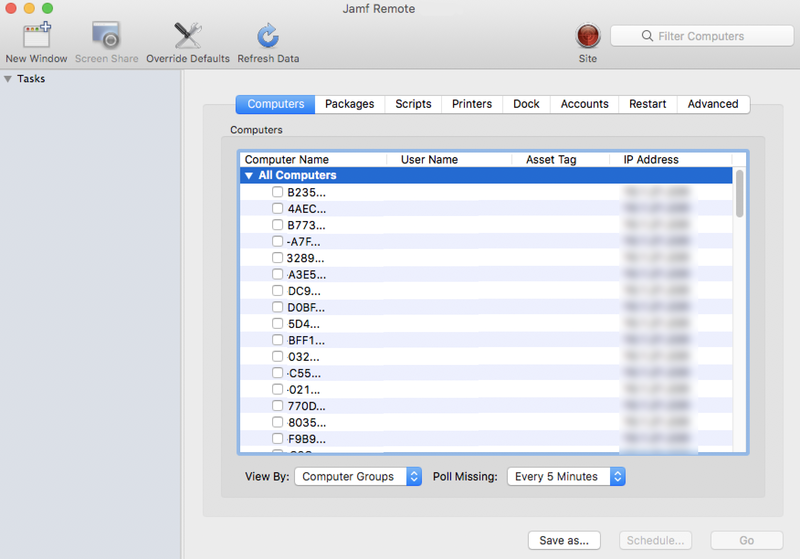 Open Jamf Remote and authenticate to the Jamf Pro server. Click Site and choose a site. This determines which items are available in Jamf Remote. Note: This button is only displayed if you have a site configured in Jamf Pro and are logged in with a Jamf Pro user account that has full access or access to multiple sites. In the list of computers, select the checkbox for each computer from which you want to uninstall the package. 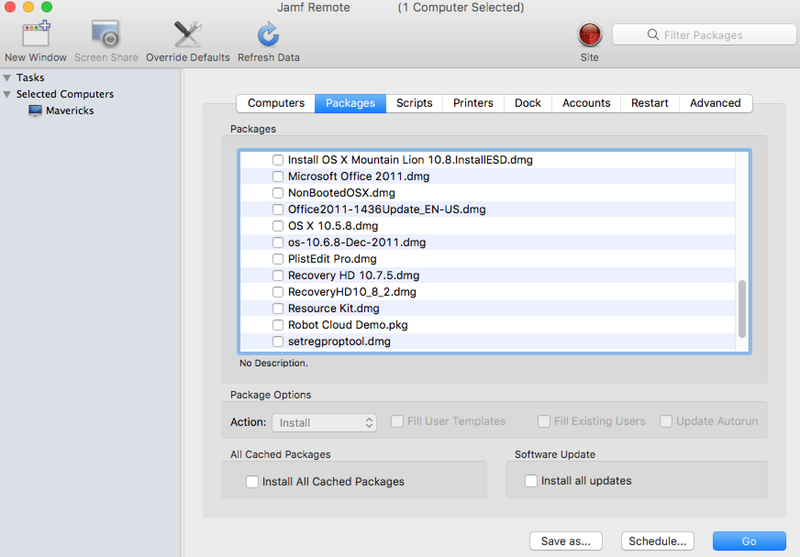 In the list of packages, select the checkbox for the package you want to uninstall. Choose "Uninstall" from the Action pop-up menu. Click the Restart tab and configure settings for restarting computers. To immediately perform the tasks on the specified computers, click Go. To schedule the tasks to take place at a specific day and time, click Schedule and choose a day and time. Then click Schedule again. Learn the basics about policies. Find out how to create policies, view the plan and status for a policy, and view and flush policy logs.